Professor Grim Nile is the older brother of Westy Nile who grew up studying a classical music, woodworking and what he calls witchcraft. Majoring in idealogy, he taught the subject for a number of years and now demands to be referred to as Professor. In Moskeeto's later years, Grim felt the negative influence of the governments warhammer slamming down on his brothers band as people began to equally persecute him, so he retreated from society just as his brother did. At first living in the underground tunnels of cities in Britain such as London, Grim eventually found himself nestled uncomfortably in an old abandoned wooden church in rural England. Passerby heard strange sounds emerging sporatically from the church, and it began to become feared as people thought it was haunted. These sounds, though foreboeding, were actually Grim constructing a symphony of puppets and classical instruments out of spare wood from the church, and learning how to control them part mechanically and part telepathically. Then one day Grim was suddenly forced to abandon much of his work as local men tried to burn the supposedly haunted church down. Back in society, he discovered an original KrispyKon CD with his brothers name on the front of it: It Fell from Below, featuring the track "Sharp" with guest guitarist Westy Nile. He then set out carrying what remaining puppets he had salvaged and found Frostbite Studios Records, reuniting with his brother and joining KrispyKon. 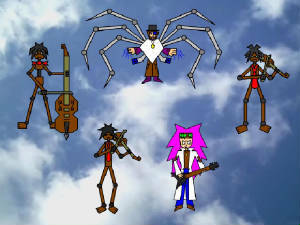 Grim wears a ragged poncho, top hat and monocle, in addition to a backpack rigged to erupt up to eight enourmous spiderlike legs and raise him up to ten feet in the air. 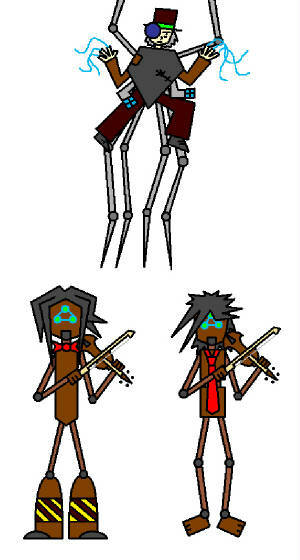 By controlling these legs as well as the clunky, otherwise lifeless puppets with specially designed controllers that hang from the backpack under his fingertips, he supplies the orchestral side of KrispyKon. Grim resided in the haunted hallway in Frostbite Studios Records with his brother and G-Host, but has moved into the crispy con with the rest of The Icily Polite. His hair is graying at an alarming rate.